At the very heart of Taiwan is Nantou County, and at the center of this county is the scenic Sun Moon Lake in Yuchi Township. It is the largest and most popular lake in Taiwan. It is called “Sun Moon Lake” because its eastern side resembles the sun, while the western side, a crescent moon. At the middle is a tiny island called Lalu Island, a sacred island of the Thao aboriginal people. 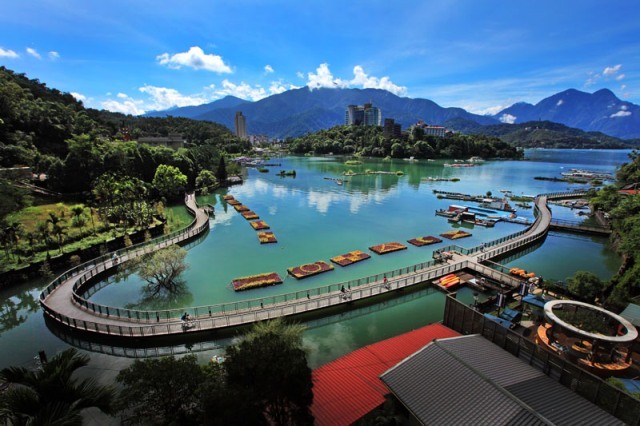 The area is referred to as the Sun Moon Lake National Scenic Area. The lake is surrounded by hills, mountains, tribal villages and other attractions. This scenic area is beautiful, to put it simply. The lake’s waters are crystal green, reflecting the picturesque hills and looming mountains. The view is made even more stunning by the ever-present and ever-changing mists, putting to life Chinese landscape paintings. The area could very well be one of the most alluring, tranquil and inviting natural attractions in the world. Once visitors get to see it, they would simply sit still, watch the mists float by for hours, and never forget the experience. It is a stunning sight regardless of the time or season, whether the lake is bathed in golden sunlight or magically shrouded in mist. The best ways to viewing and taking in the beauty of the place is to leisurely stroll along the shores, ride a bicycle and let the cool breeze touch your face as you circle the lake, take a boat ride, or climb one of the nearby mountains to get a stunning aerial view. Sun Moon Lake is clearly the most photographed area in Nantou, and probably in all of Taiwan. According to popular folk belief, Sun Moon Lake was discovered by the Thao people. Stories say that ancient Thao hunters were captivated to see a huge deer on the mountains and longed to feast on its meat. They chased the elusive deer through the forest until they reached the mountains of Shueishalian where the lake is located. The deer jumped into the lake and was trapped. As the hunters also jumped into the crystalline green waters, they were amazed to see a bounty of fishes. The ancient people then decided to settle in the areas surrounding the beautiful and bountiful lake. Soon, the Thao tribe was joined by Han Chinese settlers and Pingpu aborigines. During the Japanese Occupation, facilities and infrastructures were built in the attempt of establishing the area as a source of hydropower. The Japanese built roads that allowed easy access to the lake. After Taiwan was restored to China, the lake was again re-established as solely a tourist destination. Several temples were built or renovated around it. These temples are Syuanguang Temple, Syuanzang Temple, Wunwu Temple, and Ci-en Pagoda. In 1999, Taiwan was struck by a damaging earthquake. The 921 Earthquake rocked leading tourist attractions including the Sun Moon Lake National Scenic Area. The provincial government, however, repaired damages and significantly invested in transforming the area into the major tourist attraction that it is now.